Just before a speeding tanker truck rolled over onto three vehicles on Route 2 in Lincoln yesterday, Nancy James of Concord checked her rearview mirror and quickly turned to the left. “That’s what saved my life,’’ said James after the tanker crushed much of her 2007 Toyota Avalon but not the driver’s seat. James was not injured. 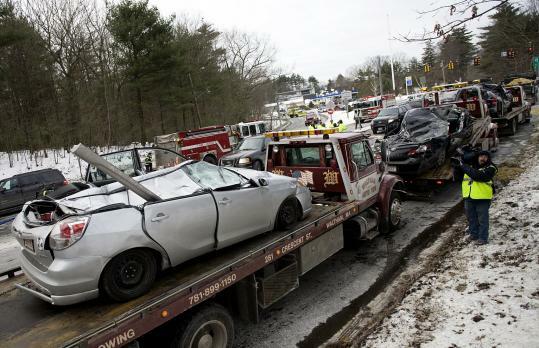 The crash on Route 2 west occurred at 9 a.m. near the Crosby’s Corner intersection and the border with Concord. The tanker drove onto the right shoulder of the roadway and rolled over onto the vehicles to its left, State Police said in a statement. “Then there was all this crashing and crushing, and I know I hit the car beside me because I was forced into it by the impact,’’ James said. The driver of the tanker, John Revene, 47, of Westborough, suffered serious injuries and was flown via helicopter to Massachusetts General Hospital in Boston. He was issued a citation for speeding. Elizabeth Buchanan, 52, of Arlington was treated for minor injuries at Emerson Hospital in Concord. Her 2006 Toyota Matrix was crushed by the rear end of the tanker. Christiane Rabich, 48, of Ontario escaped injury when her 2000 Chrysler minivan was partially crushed by the tanker’s cab. James said a man who witnessed the accident from behind pulled her out of her car window shortly after the crash. Trans-Spec Truck Service of Millbury owns the tanker, State Police said. Jay Howard, president of Trans-Spec, said Department of Transportation officials inspected the tanker and found no brake defects. A speeding ticket from 2006 was the only one on Revene’s six-year driving record with his previous employer and with Trans-Spec, Howard said. Revene should have been driving a different route, Howard said. The accident, which caused authorities to close the road and divert traffic heading in both directions, was cleared by 11:30 a.m. The tanker truck was carrying about 8,500 gallons of diesel fuel, none of which spilled, State Police Sergeant Michael Popovics said. The accident is under investigation.